With Advent begins the frantic cooking and baking in my kitchen. Over the years it has become somewhat of a tradition that friends and family receive little gifts of homemade treats. The warm fuzzy feeling I get when wrapping spiced cookies, little festive tarts, nutty and boozy cakes or jars of preserves in sparkly golden bags tied with bows and sealed with an angel for good luck, is unbeatable. It’s Christmas after all and a bit of kitsch is allowed! Seeing that I cannot deliver warming treats to your doorsteps, it’s become tradition that I spend most of December sharing these sweet sins with you virtually - complete with ribbons and angels. First however, I would like to welcome and say a big hello to all the new readers and visitors coming over from Kwerfeldein.de, Germany’s biggest online photography website, where my styling article was featured in German on their website. Welcome to all the readers from Brigitte.de, a very popular German women’s lifestyle magazine, who have nominated What’s For Lunch, honey? as one of five best blogs for the German Food Blog Awards 2011 in December. Finally a huge hello to the new readers from Harper’s Bazaar India, where I was featured in their November 2011 issue along with my dear friend Deeba and also included the amazing Pooja, Malika and Sailaja. Hope you all are enjoying my space. You’ll find plenty to whet your appetite; there’s the baking, the cooking, the travels, the ramblings, the writings and the photography - it somehow all comes together on this little space of mine. Have fun! I discovered my adoration for mincemeat while living in Qatar. Going to a British school I naturally became susceptible to many things British. One afternoon I was invited to my friend Angela’s house for tea. I was 13 and had recently discovered my passion for the great British authors, Thomas Hardy and Jane Austen. At once my wild imagination transported me to the romantic rolling hills of the greenest English countryside and I imagined myself in sophisticated company, in a room lit with the warmth of a crackling fire and the tones of a pianoforte playing in the background, while subdued conversation is made around a beautifully set table adorned with teacakes, tiny sandwiches, pastries and steaming pots of tea are passed around. This was, of course, was far from reality. We were in Qatar in December where the warmth came from the blazing sun and the only hills were those of the sand dunes and the background noise was the constant buzz of the air conditioning units found in every house. And in this untypical ambience I came around to sample my first mincemeat pie. Angela’s mother had just opened a box of pies, which she managed to smuggle into the country. The fact that there were parts of a pig and alcohol made these pies one of the many forbidden fruits in the Islamic country. Unprepared of what was awaiting me, I was expecting to bite into a hearty meat pie of some kind, for to me “mincemeat” always was the same as ground meat, be it lamb, beef or poultry. Instead my taste buds were sending out signals of sweet, moist fruit and nuts tucked inside a flaky, albeit slightly stale, pastry. The receptors in my brain were extremely confused and I presume the look on my face revealed my confusion to my hostess. “No real meat in there, love!” she said knowingly. Angela’s mum was not a good cook, she could unpack boxes and open cans, reheating the contents in the microwave or the oven. Although I had just been served some pretty stale mincemeat pies the flavor and aromas stayed with for a long time. It wasn’t till my mum’s best friend’s mother, the incredible Tante Stephanie, invited us to visit them in France one Christmas, that I could really revel in the tastes of a British Christmas, for Tante Stefanie was half Scottish and even though she lived in France with her French husband, she paid great attention to upkeep her Scottish traditions, especially in the kitchen. Before leaving I had asked Tante Stefanie on the phone if she made mincemeat pies for Christmas. She was amused by my question and told me that I would get all the mincemeat pies I could eat. I am not sure why, but for most of the 6 hour flight to Paris, all I could think about was the mediocre mincemeat pies Angela’s mother had served us. For me, they were the best pies, albeit the only mincemeat pies, I had ever tasted. That Christmas however, Tante Stefanie showed me what real, homemade mincemeat pies really tasted like. She took me into her kitchen and together we prepared the pastry for the mincemeat filling she had already made weeks ago. And while we rolled out the dough she told me what made up a really good mincemeat. Then she took my hand and together we walked over to her large pantry tucked away at the back of the kitchen and there, lined on neatly arranged shelves, I saw jars of the glistening fruit, stacked upon each other. Back in the kitchen, we spooned the filling into the pastry shells, the aromas of the spices making giddy with anticipation. Finally the pies were pushed into the oven and a few minutes later they came out piping hot and golden. We sprinkled the pies with some toasted hazelnuts and sifted icing powder. Tante Stefanie cut one of the small pies in half allowing the steam to escape, gently blowing on one of the pieces she handed it over to me and she waited. It was a sublime moment, which has been branded into my taste buds forever. All these years later, whenever I see a mincemeat pie my taste buds never fail to remind me of that moment. I have never been able to recreate Tante Stefanie’s recipe, even though she left the recipe with my mum. Somehow, the mincemeat pies never quite tasted like they did, that day so many years ago. I still love mincemeat and over the years have often made many variations. Although, I do not make it every year, when I do I try to add a new twist to it. This year I used quince, which I paired with toasted hazelnuts, dried cranberries, plump yellow raisins and a good glug of cognac. I also use butter instead of suet in my mincemeat as suet is just something I do not do in my kitchen. Butter makes the mincemeat divine, carrying the flavors of the spices and blending it with the fruits perfectly. In a medium saucepan put the lemon and orange juices and zest, then grate the quince and apple into it. Stir the fruit so that it does not discolor. Add butter cognac, dried fruits, candied peel and all the spices. Over a low heat, cook for 1 hour stirring frequently until the quince and apple have broken down. Once the dried fruits are plump and the liquid has evaporated remove from heat and allow to cool. Mix in the sugar and hazelnuts. 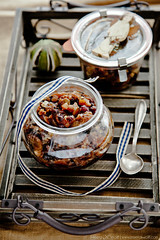 Spoon the mincemeat into sterilized jars and seal tightly. Note: As this mincemeat uses butter instead of suet it has a shorter shelf life. It needs to be refrigerated and will keep for a month. You can freeze the mincemeat too and then it will keep for at up to 6 months. Not everyone shares my love for mincemeat, I know. It is an acquired taste, but once it is acquired a deep sense of pure satisfaction is achieved. In this mincemeat the sweet, slightly tangy flavor is highlighted perfectly, adding subtle citric notes to the mincemeat. The quince works it’s magic here and adding it’s wonderful aromas to the entire mixture and the butter makes the whole thing simply heavenly. If you have avoided mincemeat before, take a leap of faith with this recipe I am sure you will not regret it. If you cannot find quince then simply use apples or experiment with pears. Play around with different dried fruits too, in the past I have added dried blueberries, sour cherries and even candied ginger. The possibilities are plenty! Next week I’ll share a simply sublime tart using this mincemeat recipe - so make sure you make enough of this. Enjoy! Registrations to the third From Plate to Page are open we have a few spots free, so come on over and check out our incredible programme, take in the beauty of our venue and register here. It makes an awesome Christmas present, especially if you have always wanted to hone your skills in food writing and photography, From Plate to Page is the only intensive workshop that provides you with both. Read what past participants have said about our workshop! Wow, what an amazing creation! A classy and very original mincemeat which i'd love to taste. Those clicks are fabulous. Great hues of brown and orange. This recipe shurely will make a furor in the Christmas eve. I will definitely try it. Thakn you so much for sharing it! Happy holidays! I do love making mince meat everyyear for my pies and I love yr version.Its a good excuse to use a good 12 yr old armagnac..I make mine with loads of fresh cranberries!! Mincemeat is something entirely unfamiliar here and I was only introduced to it a couple of years ago when my English collegue (and now friend) brought us mince pies for Christmas. Up till that point I had heard of it but had assumed there was actual meat in it!! Imagine my surprise. I liked them but haven't tried them since so maybe this is the year to try it myself! I'm going to make a version of this...I'm not sure about getting quinces. Looks fab Meeta! Time to get those pies happening! This reminded me of listening to one of my favourite authors Chimamanda Adichie talk about her childhood in Nigeria. She was addicted to reading Enid Blyton and dreamed of drinking ginger beer and eating potted meat sandwiches - she had no idea what either of them tasted like but they sounded exotic! Stroke of genius to put quince into homemade mincemeat. There's nothing better than the gift of a homemade treat - it's something people don't forget and can enjoy immediately! Love your take on mincemeat and the presentation is gorgeous. Baby, you shine brighter than all the Christmas decorations and I am so proud of you! You deserve all the awards, prizes and kudos! And I love your stories...your recipes are so rich with nostalgia! And oooh another recipe with cognac! Yes! Gorgeous photos...I love them! First of all congrats on your feature and nomination. Thomas Hardy (Far from the Madding Crowd so ahead of its time) and Jane Austen have always been favorites. Never tasted mincemeat before, is it eaten straight or mixed with yogurt? Your pictures are wonderful. A big congratulations on all the features Meeta, that's spectacular! I'm laughing at your story of being surprised when you first had the mincemeat pies that they were sweet! lol You aren't the only one to have had that experience. These look wonderful! I am sure I would share your love for mincemeat. i must try it! Very innovative and wonderful dish. Thank you for all your lovely comments! So glad you liked the recipe and the story. Just today, I made this mincemeat for a Thanksgiving pie. I never liked mincemeat as a child, but that was 50+ years ago, and my mother bought it in a jar. I knew I loved the ingredients, so why not? But how big is a "large lemon" or a "small quince"? And how large is your grater? Here in Southern California, lemons can be nearly as big as grapefruit and the quince at the farmers' market last week were even larger. Nevertheless, working through the bit of fear, I subbed dried sour cherries for the dried cranberries, and guessed at the quantities of citrus and quince--also I added a little more cognac, since it was feeling a bit dry before it looked done, and cognac is good. Oh my, is it sublime?! Can hardly wait the two weeks to make it into the pie. Thank you, Meeta.